I don’t believe there isn’t a single person in this world who doesn’t like fries. But I do believe there are many, many people who would rather nibble on a healthy version of the ordinary fat-filled greasy french fry. And this recipe is for you! Super-healthy baked zucchini fries, coated in a seasoned breadcrumb mix and baked in the oven until they’re crispy and golden brown. After just one of these, you’ll never think about boring ordinary fries ever again. Grilling season is just around the corner and with that comes all kinds of BBQ, picnics and pot lucks. And you don’t want to be that person who always brings the healthy salad you swear tastes delicious but no one else touches. Believe me, I’ve been that person plenty of times. 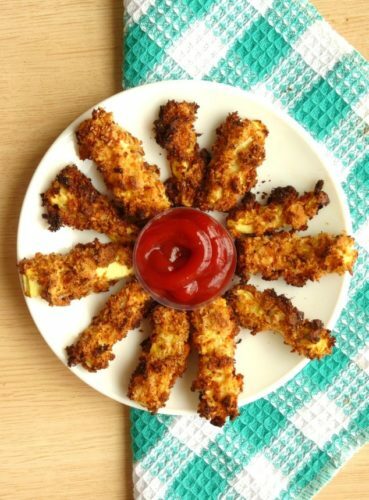 Which is why you need this recipe for baked zucchini fries! It’s familiar enough for everyone (even kids!) to get on board with it, especially if you serve it with ketchup. But it’s also healthy enough so you and anyone else taking good care of themselves can dig in and feel good about it, too. 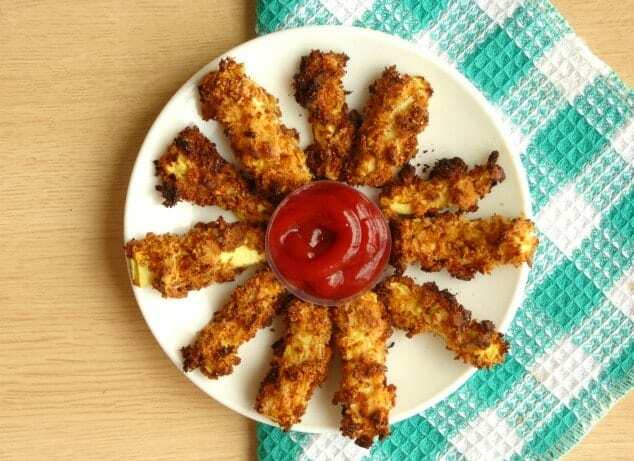 You can totally eat these baked zucchini fries on their own with your favorite dip. Or pair them with another healthy dish to make a super nutritious meal! They work amazingly well with these BBQ cheddar chickpea burgers and these overflowing chickpea sloppy joes. YUM! But however you decide to eat them, you can wholly enjoy them, knowing that not only do they taste great and have the most amazing texture, but they’re also good for you, too! And what could be better than that? Preheat the oven to 400F/200C and line a baking tray with a non-stick mat. Peel the zucchini and slice it into chunky wedges. Tip the panko breadcrumbs onto a small plate and stir in the garlic powder, onion powder and salt. Pour the egg white (or vegan alternative) into another dish. Dip each zucchini wedge into the egg white/vegan alternative dish then dip it into the breadcrumbs, making sure all sides are totally covered. Place the coated zucchini wedge on the lined baking tray and repeat with the remaining wedges. Bake the coated wedges in the preheated oven for 25 minutes, until the breadcrumbs are crispy and golden brown. Enjoy straight away with your favorite dip while hot. These fries look absolutely delicious! Wish I could grab a few! Thanks so much, Marsha. They really are! 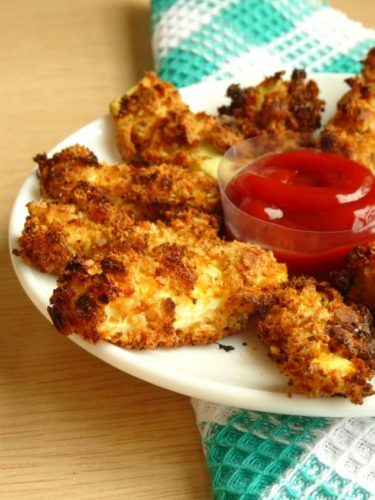 These look as if they’d make a great party appetizer! That’s such a great idea, Alyssa! I love Zucchini fries and fritters. I think the zucchini is so not used enough in our cooking. It’s so versatile. I’ve never tried zucchini fritters before. They’re definitely next on my to-make list! Boy do those look nice and crispy! I love zucchini and I’ll be saving this recipe for the summer when we are overflowing with zucchini from the garden. Looks delicious! Thanks so much, Denise! The panko breadcrumbs do make them super crispy and delicious. Oven baked is such an amazing and super healthy way to prepare food. Food is not loaded with excess fats just lovely flavors. 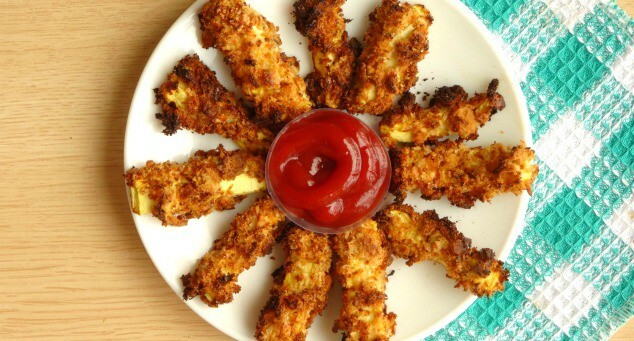 Love this zucchini fries. I bet my kiddo would love it. Yum! I couldn’t agree with you more, Natalie! I did not see what the oven temp was to be set @ . Sounds great wanna try them. I’m Nicola, the face behind Happy Healthy Motivated – your go-to guide to becoming your best you!